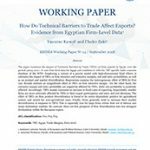 Since the seminal paper of Sachs and Warner (1995), several justifications have been advanced to explain the observed disparities in the performance between the oil resource dependent economies. The most important one deals with the quality of the institutions although no agreement has been made on the importance of their role, or the direction in which they affect economic growth. Some recent studies point to the interaction effect on growth of both “natural resources” and “institutions” factors. 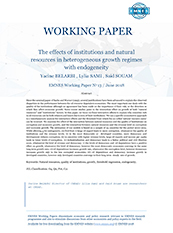 In this paper, we focus on these interaction effects to explain why countries rich in oil resources can be both winners and losers due to ions of their institutions. We use a specific econometric approach to e simultaneously analyse the interaction effects and the threshold from which the so-called ‘natural resource curse’ can be reversed. We examine the effect of the interaction between natural resources and the quality of institutions on corruption and economic growth, and the interaction between natural resources and the revenue level on corruption and economic growth. The estimation of our models is based on a sample of 24 countries for the period 2000-2015.